Jerry Hay is available for visits to book stores, organizations and schools. Please email IWAHAY@gmail.com for a price quote. Include your organization name, location and approximate date. Shown in the photo is Jerry doing a book reading program at a book store in Memphis, TN. He has a very special program for elementary schools. Scroll down for details. Author visits to schools are beneficial to students. When well done, they will not only entertain students but inspire them to read and write. Shown is Jerry Hay speaking to students at Dixie Bee Elementary in Terre Haute, IN. The media specialist, Mrs. Bedwell wrote, " We all thoroughly enjoyed your talk. You really engaged the children and the adults alike. I've heard only positive comments from both children and teachers. Thank you so much for introducing us to Gilligan." How does one get children to understand the rivers and their importance? By having a fun lesson! One way Jerry does it is to select the nearest stream to the school, then show how far a rubber duck might travel if put into the stream. The children will be fascinated by the connection each tiny stream has with the rest of the world, as the rubber duck travels from one river to another, searching for the sea. Students will also get a sense of the historic significance of rivers as Jerry talks about the early explorers and his own adventures on the rivers. The true story about A Goose Named Gilligan is always popular with children of all ages. 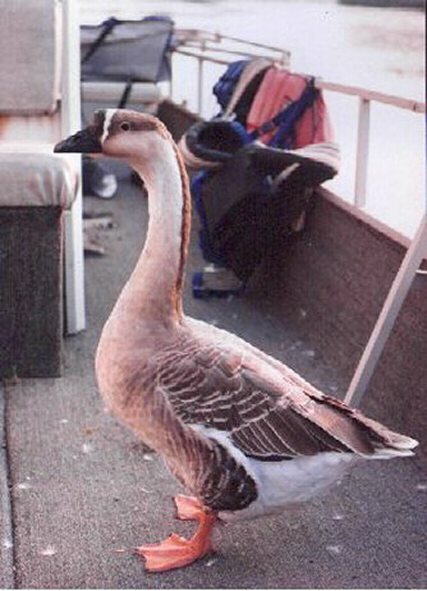 Jerry tells the story of how he rescued the goose, how they became friends and some of the adventures that they have had together. This story is such a hit that it became a popular children's book. Another important subject that Jerry often talks about is water safety. He explains the dangers of wading in rivers and the importance of wearing life jackets on boats and docks. This is not done with scare tactics. He explains the dynamics and dangers of moving water and why it can be dangerous, so that children are not just told to be careful, but given a clear understanding of why they should be careful. The theme can vary in his talks but there are a few things that are always encouraged. Those are the importance of reading and writing, respect for wildlife and an understanding of our waterways. His talks will be understood and enjoyed by students from Kindergarten to sixth grade. He enjoys interacting with students and is not comfortable behind a podium, preferring to make eye contact and keeping the students interest. He is not encumbered with scripts, notes and other devices. All that is needed to prepare for his visit is a microphone, if the audience is large. Jerry also encourages parents to come, where school facilities permit.